Smite is a "third person action multiplayer online battle arena (MOBA) video game" (as Wikipedia narrows the genre down in its customarily helpful manner) which allows players to play various gods, goddesses and other mythological beings from a variety of mythologies, including the Norse pantheon. It has come into focus recently as an Xbox One version was released last month. Technically, as the term "anthropomorphic" was actually coined to describe a deity, all the gods of Smite are anthropomorphic. However, the handful who are also anthropomorphic animals (which also, technically, means the furry characters are less anthropomorphic than the more human characters), such as Fenrir and Anubis, are the true furry draw. And on June 2 this year, Ratatoskr was added to the roster (music warning on the last link). His reveal trailer can be watched here. 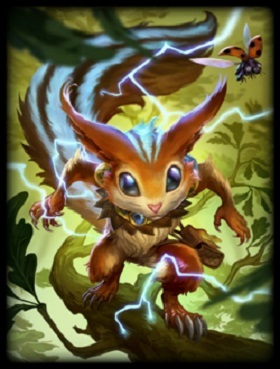 Despite possessing a relatively high voice, Ratatoskr in Smite is obviously a male, and the game lore describes him using male pronouns. Perhaps this is the greatest clue as to how small a role Ratatoskr previously played, because the very next day after making his video game debut, Ratatoskr also made her comic book debut, and the two sources couldn't even agree on gender. Thanks to the Mighty Thor, all of Norse mythology is roughly canonical in the Marvel comics universe, including a gossipy squirrel named Ratatoskr. 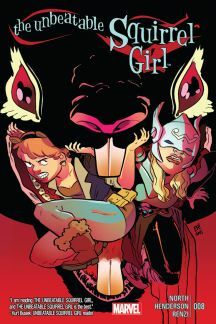 Beginning in the sixth issue of The Unbeatable Squirrel Girl, which, as noted, came out June 3, Ratatoskr, originally disguised as the super-heroic squirrel Girl Squirrel, was the villain for the final arc of the first volume of the series. While the Smite version of Ratatoskr seems to cast the squirrel in a heroic, if trickster-y light (or at least as much as one can be in an essentially plot-less game), the comic book version is decidedly a bad guy, using her magically enhanced skills as a gossip to sow discord in both the masses and throughout Marvel's superhero populace. This makes her a perfect foil to cult heroine Squirrel Girl, who deals more in bringing people together then tearing them apart. That, and Ratatoskr is essentially the only squirrel-themed character who could possibly be seen as a villain in the Marvel universe (or comics in general, for that matter). Though it'd be a spoiler to reveal whether Squirrel Girl defeats the villainous Ratatoskr (most readers probably have a pretty good guess), it remains to be seen whether the two characters will clash again in the future. A quick e621 check reveals ... one piece, and it was blacklisted for me as explicit, so who knows which version it was. Definitely Smite. One comment: "Hey, Keep your eyes off my nuts. >.>"
I would like to point out that I made it through an entire article about a squirrel without a single "nut" pun. It was Marvel Comics that came up with a male superhero named the Banshee, so I don't have much respect for Marvel's ability to tell one gender in mythology from the other. The s-f fan Bruce Pelz (1936-2002) published 47 issues of a fanzine titled “Ratatosk” from November 1964 to May 1967. He said that it was named after the squirrel in Norse mythology, and he always referred to Ratatosk as “him”. Flayrah: educating me on norse mythology.